This is the third book in the Rebecca Robbins series. I have previously reviewed the first two books, Skating Around the Law and Skating Over the Line. Somehow, Rebecca Robbins has found herself roped into sitting in the dunk tank at Indian Falls’s Native American Days celebration. Or, at least she got roped into agreeing to it. When her grandfather’s Elvis act goes awry, Rebecca gets one of the local roller derby gals, Sherlene-n-Mean, to substitute for her. It all seems innocent enough, until Sherlene dies in the dunk tank from an electric shock; one that may just have been meant for Rebecca. In Skating on the Edge, Charbonneau keeps the Rebecca Robbins series fresh with the addition of the rink’s new roller derby girls as fairly major characters. These additions keep Charbonneau from having to bump off the entire town of Indian Falls, and because the girls are a cohesive unit, there is an increased feeling of urgency to figure out what is going on once Rebecca gets involved with them. 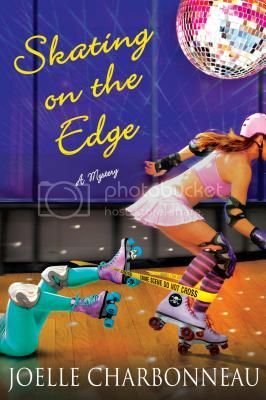 As is typical with Charbonneau’s books, Skating on the Edge is a smart, funny mystery. It could certainly be read on its own, but if you haven’t read the first two books in this series yet you should do yourself a favor and pick them up.